On Earth-65, Gwen Stacy was bitten by a radioactive spider instead of Peter Parker. Taking the name Spider-Woman (and affectionately called Spider-Gwen by her fans), she uses her great powers responsibly to protect New York and the Web of Life! Spider-Woman’s origin revealed! Following her fateful arachnid encounter, Gwen parlays her new powers into celluloid stardom instead of using them responsibly. However, after failing to save Peter Parker’s life when he transformed himself into the Lizard, she decides to use her gifts to fight crime, and saves her police captain father from a Rhino attack! The Inheritors are hunting spider-powered people across time and space! 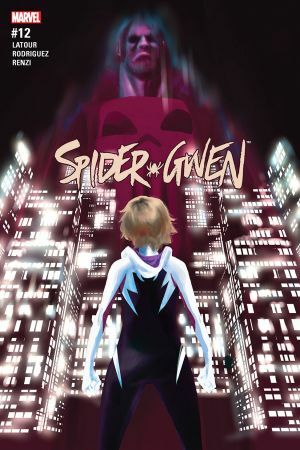 Spider-Gwen joins the fray and teams up with an interdimensional army of spider-heroes to protect their own kind. 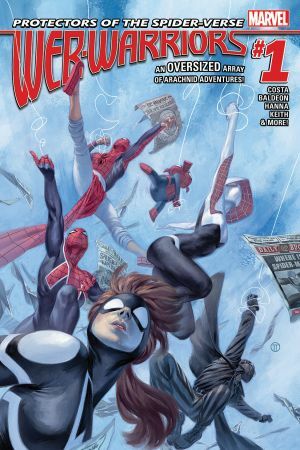 It’s every Spider-Man and Spider-Woman ever with the fate of the multiverse at stake in the pulse-pounding Spider-Verse event! 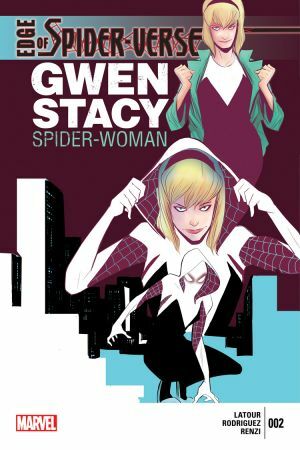 Gwen debuts in her own ongoing series! The NYPD still has Spider-Woman at the top of their Most Wanted list, and now the loose cannon cop Frank Castle is heading up the task force to capture her. 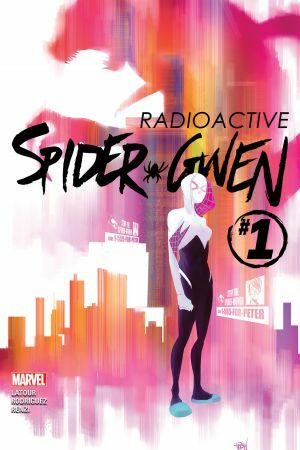 In addition to avoiding the police, Gwen also has to contend with the Vulture, Black Cat, the Hand, and the strain that her double life is putting on her relationships with her friends and father! When the Lizard resurfaces in New York, Gwen is initially shocked at the possibility that Peter Parker has returned from the dead. However, she quickly reasons that it must be the only other person to know about Peter’s experiments: Curt Connors! She tracks him down into the sewers and partners with Captain America to take him out! 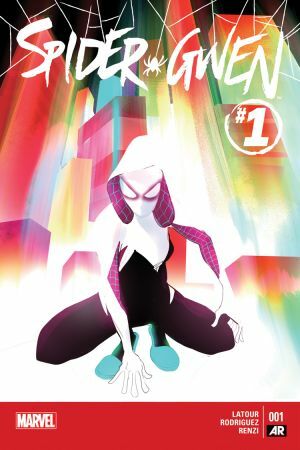 Spider-Gwen teams up with her allies from the Spider-Army to fight the foes no single spider-hero can withstand! Inspired by the reality-hopping technology he bore witness to during the events of Spider-Verse, Max Dillon assembles a consortium of alternate reality Electros to further their own villainous goals. 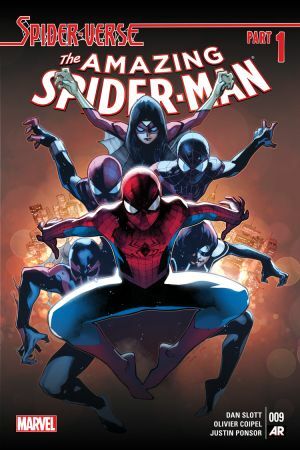 It’s up to Spider-Woman, Spider-UK, Spider-Ham, Spider-Girl, and a host of others to stop them! Gwen finds herself in caught in a web of interdimensional intrigue! 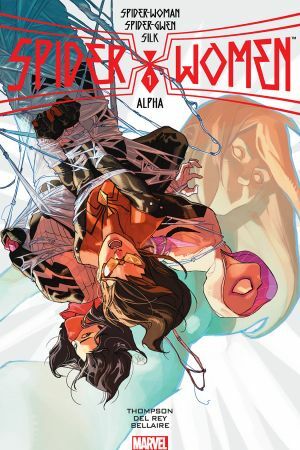 While brunching with the Spider-Woman and Silk of the mainstream Marvel Universe, she and her comrades are attacked and her portal device is stolen. The heroes then discover that their enemy is the nefarious organization called S.I.L.K., led by an alternate universe version of Cindy Moon! A depowered Gwen Stacy struggles to take down the Punisher with the help of temporary power boosts. Will her artificial abilities be enough to take down her nemesis, let alone the Bodega Bandit?! All this, plus the Kingpin (Matt Murdock of Earth-65) makes Gwen an offer she can’t refuse! 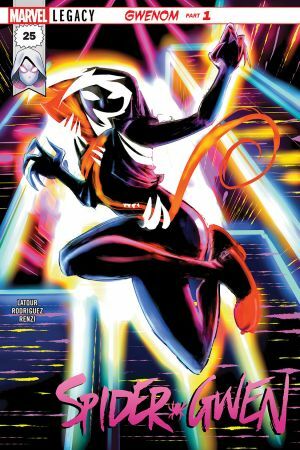 In an effort to regain her powers, Gwen bonds with a version of the Venom symbiote. While it does grant her the super powers she craves, it also brings out her darkest impulses. She brutalizes the Enforcers for information about the Rhino, and sets off on a revenge tour to track down the villain who left her father in a coma.